Online slots developer Microgaming signed an exclusive supply deal with fellow developer Rabcat Gaming in November 2014 and one of the consequences of that agreement was this little 5 reel, 15 payline slot Castle Builder. 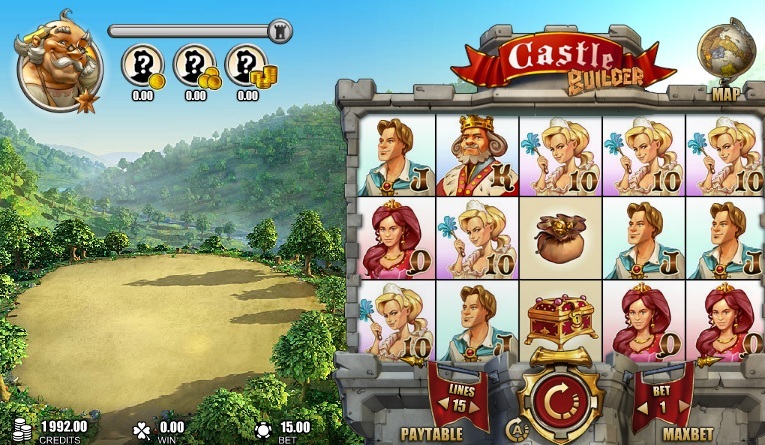 Castle Builder was unveiled by Microgaming at the same time as its Chinese New Year-themed slot Gung Pow in a double launch to start 2015 with a bang. The two slots have completely different themes which was great to see. 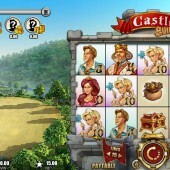 The symbols on the reels in Castle Builder related to the slot's medieval theme including a King, Prince, Princess, Maid, money, jewellery box, a locked door, and a treasure chest. The architect represents the Wild symbol and he will substitute for all other symbols to help complete winning combinations and earn you payouts. However, it will not substitute for the building materials symbols. Spin Away and Build Your Castle! The aim of this slot is unique in the terms that it is essentially a slot but there is an ulterior motive. As you spin the reels and try to hit symbols across the different paylines, you must also focus on building a castle. This task is what forms the bulk of the main feature on this slot. You will notice that there is a symbol that consists of building materials. If you hit two of these on the active paylines then you will receive standard value blocks. If you hit three of these symbols on the paylines you will earn bronze value blocks. If you manage to hit four of these symbols across the paylines you will get silver value blocks. If you are fortunate enough to hit five of these symbols across the paylines you will be awarded gold value blocks. The aim is to build your castle with the highest value blocks possible. Every time you hit the building materials symbols across the reels, the castle will be built to the left hand side of the reels. Once the castle has been built you will then be shown a cut scene where the King is presented with three different potential suitors for his daughter, the Princess. You must then choose which one of the suitors you wish the Princess to have. You will then be awarded a prize depending on which suitor you pick. The more valuable the castle you have built, the higher all three potential prizes will be. After you have received your prize from the potential suitor you have picked then you will then spin the reels again to build the next castle with the opportunity to pick the next potential suitor for the Princess or Prince and win a cash prize. You can keep tabs on your progress by viewing the map situated at the top of the reels at any point to see which castles you have already completed. Castle Builder is another more unique slot from Microgaming in the same vein of the arcade-style Max Damage and the Alien Attack. However, this is more enjoyable than Max Damage. It is arguably slightly repetitive and the lack of a free spins bonus round does take away a certain amount of depth from the slot but the level progression feel to the game ensures it is entertaining enough.